Forget that, I want to see the 4-row cars that it supposedly launched with. Mike240SX wrote: Forget that, I want to see the 4-row cars that it supposedly launched with. That's something I've never heard before! Would love to know more about that. This special edition of the Beast is awesome and the locals will love it. KI is doing a great job at making a 'quiet year' a memorable year. I suspect you already have. The current trains are actually the original trains, the parks maintenance staff cut the 4th row off the cars and turned them into the 3 row cars. When the ride first opened it had 4 trains with 5 cars each, when they shorted the cars they scrapped the fourth train and used it to add an additional car to the remaining 3 trains. PKI Jizzman wrote: That's something I've never heard before! Would love to know more about that. This special edition of the Beast is awesome and the locals will love it. KI is doing a great job at making a 'quiet year' a memorable year. kenban wrote: I suspect you already have. The current trains are actually the original trains, the parks maintenance staff cut the 4th row off the cars and turned them into the 3 row cars. 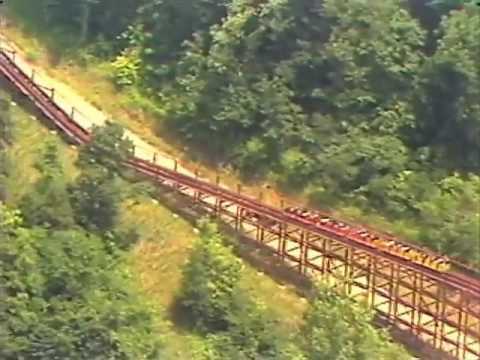 When the ride first opened it had 4 trains with 5 cars each, when they shorted the cars they scrapped the fourth train and used it to add an additional car to the remaining 3 trains. Haha no they did not just "chop off a row." That's the most GP thing I've heard on here in a while. Mike240SX wrote: Haha no they did not just "chop off a row." That's the most GP thing I've heard on here in a while. One of the designers of the Beast, Jeff Gramke, still works for the park and has discussed this at enthusiast events before. The maintenance staff has done all the modifications to those trains, from shorting the cars, to changing the lap bars, adding the seat belts, and the headrests. Those trains are the original trains, or at least pieces of them are I have no idea what percentage is original at this point. I recommend going to Coasterstock and asking him yourself. He is doing a Q&A during the event this year. Although if you have been in previous years he has explained in the past why the cars were shorted and how it was done. I'll take your word for it, but color me skeptical. Just seems like something a major park wouldn't do, even in the '70s/'80s. That’s from IAAPA 1978 and was the original design for the train for what we know as The Beast, although it is also before the park had decided on a name, they changed the look after the ride was named. Nice find. I wonder what happened to the head lights. Pedrinho wrote: Nice find. I wonder what happened to the head lights. They were replaced with the sculpted logo they have today before the ride opened due to the park expecting a lot of media coverage. Basically they wanted the rides name and logo in the pictures. The ride did open with the leather seats complete with buttons you see in the photo, but it was replaced pretty quickly in I believe the first season. If your wondering about the headlights, consider that there is an entire Beast lead car out there somewhere. The lead car of the 4th train was completely refurbished and given to Ruth Voss when she retired. Voss was the head of Media Relations at the park when The Beast was built and is credited with coming up with the name. She passed away more than 20 years ago, so there should be a real Beast lead car out there somewhere, likely in a private collection.